March protesting white trolley workers strike against black trolley operators, Philadelphia, PA., August 1944. Flip to African American James Stewart, a former musician, receives instruction on how to operate a Philadelphia Transit Company trolley car, Philadelphia, PA, July 31, 1944. Early in 1942, the Pittsburgh Courier launched its Double V campaign for "Democracy: Victory at Home, Victory Abroad." African Americans rallied to the cause during World War II, and also intensified their calls for equality rights in the workplace. 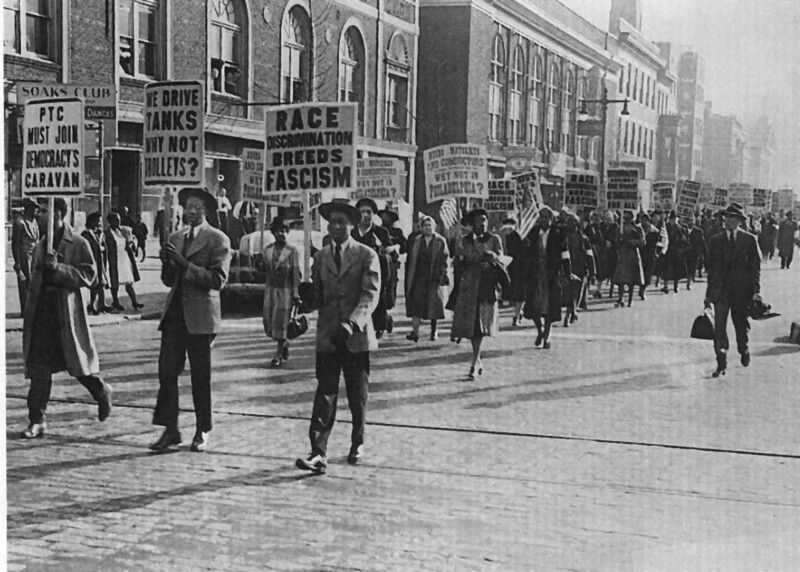 When white workers went out on strike to protest the hiring of black trolley operators, black Philadelphians mounted their own campaign in support of the operators and PRT including a march in August 1944.